The Fusion Signature speakers come in 6.5- and 7.7-inch sizes with three grill choices, same as the subwoofers (and there&apos;s also an enclosed cabin set). 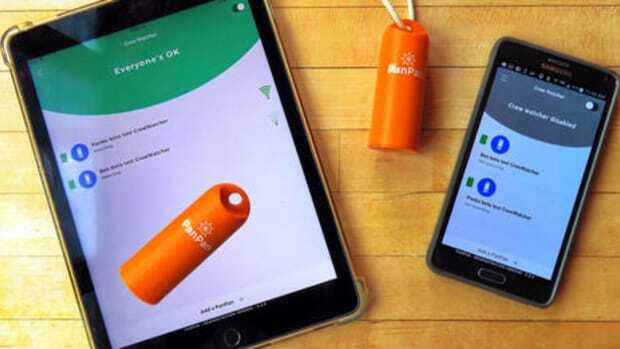 At night the bling is supplied (if desired) by diffused blue or white LEDs that can be evenly controlled with the Signature Voltage Regulator. But I suspect that the Signature Series premium pricing is mainly the result of audio nuances like the CURV composite cone design and also the extreme waterproofing. Frankly, I don&apos;t know much about why speakers sound good, but I sure know when they do. Actually, hearing is at least somewhat subjective, and perhaps especially so for someone like me who uses electronic aids. But while my beloved Phonak Smart IX technology apparently can&apos;t fully compensate for my damaged high frequency hearing, I believe the situation has made me extra sensitive to distorted music audio. And, wow, did I notice the crystal clear quality of Signature sound. In Miami, Todd Crocker played a wide variety of music genres -- and also recording eras, since the dynamic range has increased so much -- and in the numerous cases where old, eclectic me knew the cut, I felt like I was hearing it better than I ever had. Instruments and voices had a wide, clean spaciousness I now yearn for elsewhere, and that was in an open boat underway around a huge boat show and a busy city! The demo in Naples was more casual, as you may gather from my phone video attempt above. A phone is certainly not a fair way to record a premium audio system, but can you sense the big, clean sound nonetheless? It should be noted that the Team Tuppens/Garmin Jupiter 38 audio system includes lots of Signature speakers plus Fusion amps and the high-end MS-UD750 head unit (Panbo discussed here). The Regal 2800 bowrider used in Miami was similarly equipped and had even been tuned by a pro with an oscilloscope and a real time analyzer. 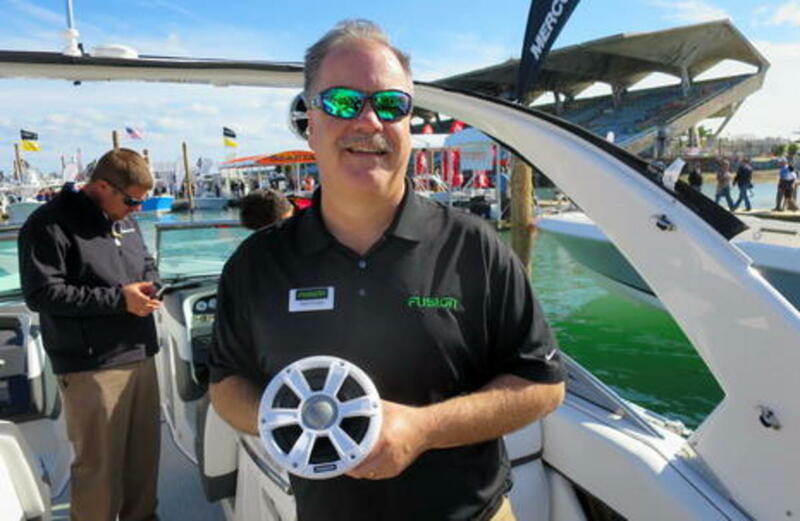 This level of marine audio is serious and seriously expensive, but they are often seen on high-end open boats nonetheless. 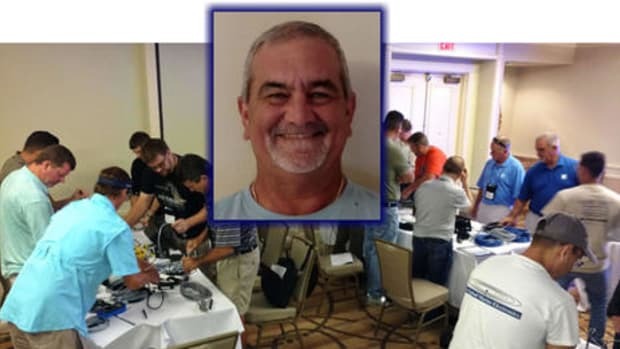 I believe that JL Marine Audio has long dominated the niche -- it&apos;s common to see a Fusion audio head and MFD integration paired with JL amps and speakers -- but now Fusion wants to provide the whole system and so does JL and others (Panbo discussion here). Game on! Actually, Fusion designs seemed aimed at everything that floats and most every taste. On the "keep it simple and out of the way" side, in January they introduced the $290 retail MS-BB100 Black Box which includes a wired remote with embedded Bluetooth for streaming from your Apple or Android phone and/or wireless remote control. 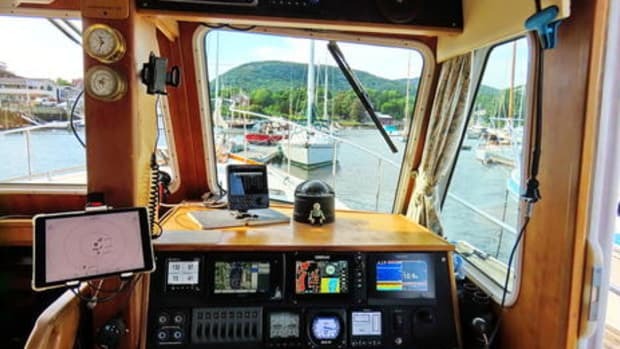 The BB-100 also has an AM/FM tuner, a USB playback port, and Fusion-Link NMEA 2000 integration with most any current chartplotter/MFD. 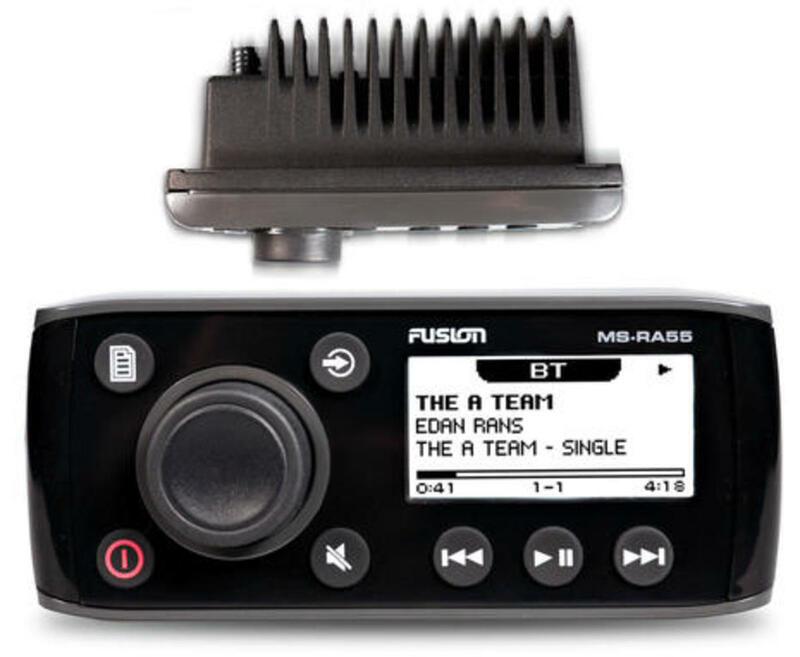 Just introduced is the compact $179 Fusion MS-RA55. Though that LCD display is purportedly daylight viewable, it&apos;s only 2.3 inches diagonally and the dash mount depth is slightly less than that. The RA55 offers the same Bluetooth streaming/remote and N2K control features as the BB100, and both also support dual speaker zones. And note the relatively big and well-separated knob and buttons, which still make good sense on a small boat. 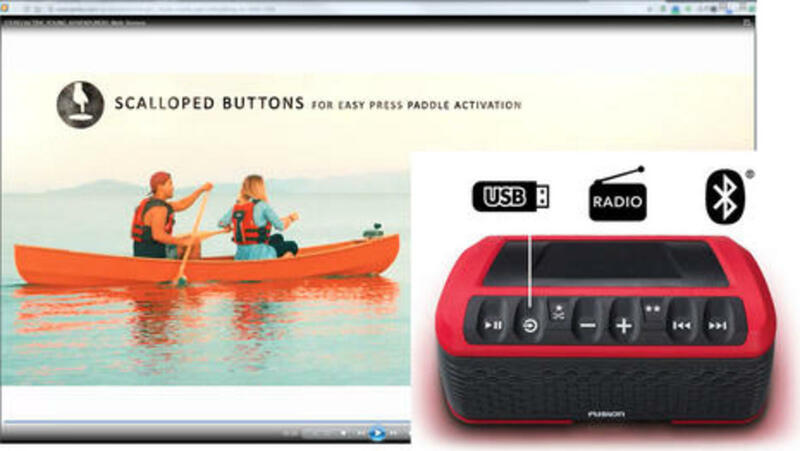 But, dang, Fusion&apos;s new StereoActive Portable Watersport Stereo -- the world&apos;s first, they claim -- has buttons you can work with a paddle blade (and apparently optional voice prompts so you know you got the right button). 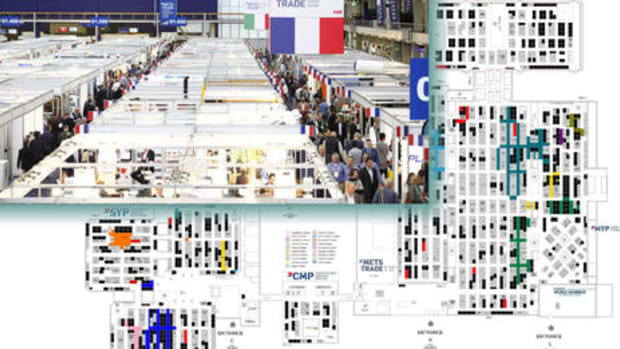 I heard a StereoActive sounding good at the NMEA Conference Expo and the overall system design is impressive. 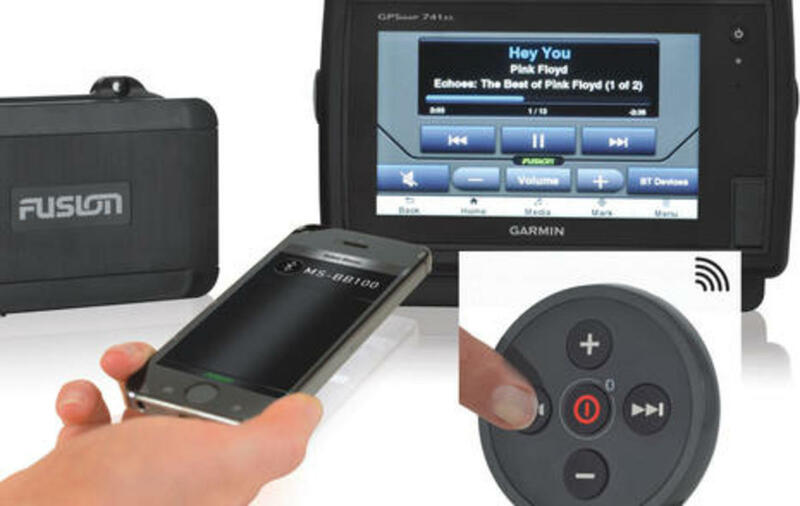 Besides Bluetooth streaming/remote, there&apos;s a waterproof USB cavity, and a variety of "Pucks" lets you clamp the stereo to your boat, or to commonly used RAM or RailBlaza mounting systems. Or you can clamp the stereo to an optional ActiveSafe, which then can clamp to a Puck while keeping your phone, wallet, etc dry and safe. On top of all that, both the $300 StereoActive and the $100 ActiveSafe float. The Fusion StereoActive - Young Adventurers video is beautifully produced, but there&apos;s more tech detail (and KiWi flavor) in this FishingWorld vid with Fusion CEO Chris Baird (and also my first look at the crazy looking Hobie Mirage Eclipse), and here&apos;s Todd Crocker showing it off well to West Marine. It looks like Fusion has innovated again, this time in watersports, and you may notice in some of the marketing how well StereoVision integrates with Garmin outdoor products like the Virb action camera seen on the canoe above (and also a great bigger boat cam). 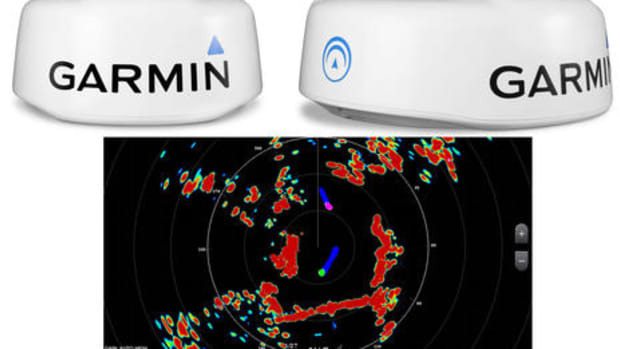 Garmin owns Fusion, so that&apos;s no surprise, but I&apos;m happy to add that both companies seem willing to dance with other partners. 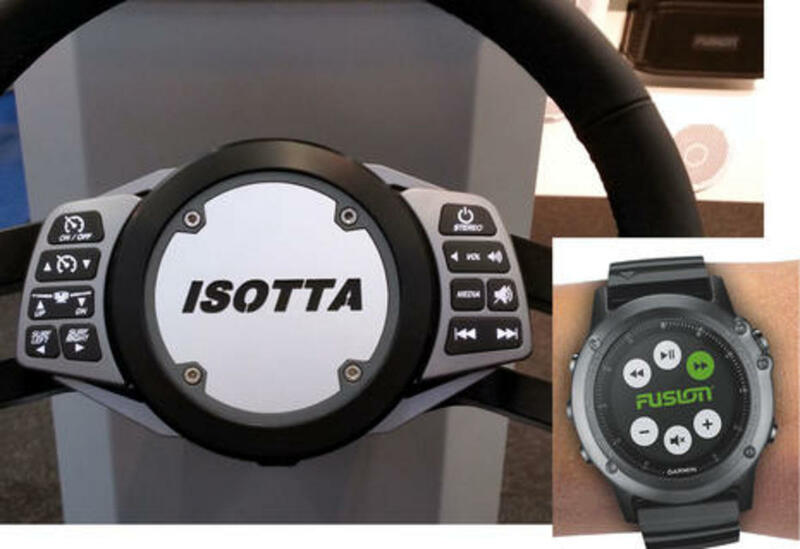 So while that is a Garmin Fenix/Quatix 3 watch using something called Fusion-Link Lite to remote control a StereoActive or another Fusion audio system, the first Link Lite product I saw was that nifty Isotta wheel at METS. In fact, according to Fusion, Link Lite is an "open source control platform that allows any accessory manufacturer the opportunity to network with Fusion&apos;s superior entertainment equipment." 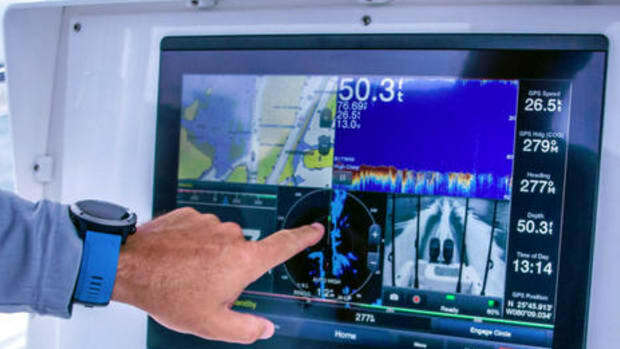 I&apos;ve also heard that Fusion will eventually add support for the new NMEA 2000 entertainment PGNs (data/command messages) that many MFD manufacturers support in addition to the proprietary Fusion-Link PGNs. And here comes Clarion. Before Fusion, it was often Clarion head units that I saw paired with JL Audio speakers and amps, and maybe the new CMS4 Multimedia Source Unit will make that happen again. 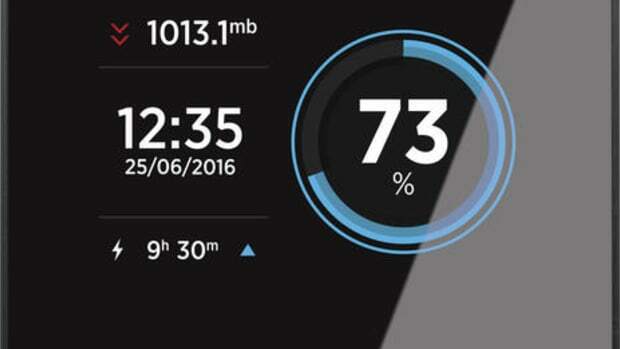 That control head above sports "an ultra-bright color TFT LCD display optically wet bonded to Corning Gorilla Glass" able to show the output of a camera with audio. Unique (I think) to the marine audio world is the CMS4&apos;s ability to manage four different media sources going to four different speaker zones (Rockford Fosgate can manage two sources, you may recall, and so far Fusion does not multisource). 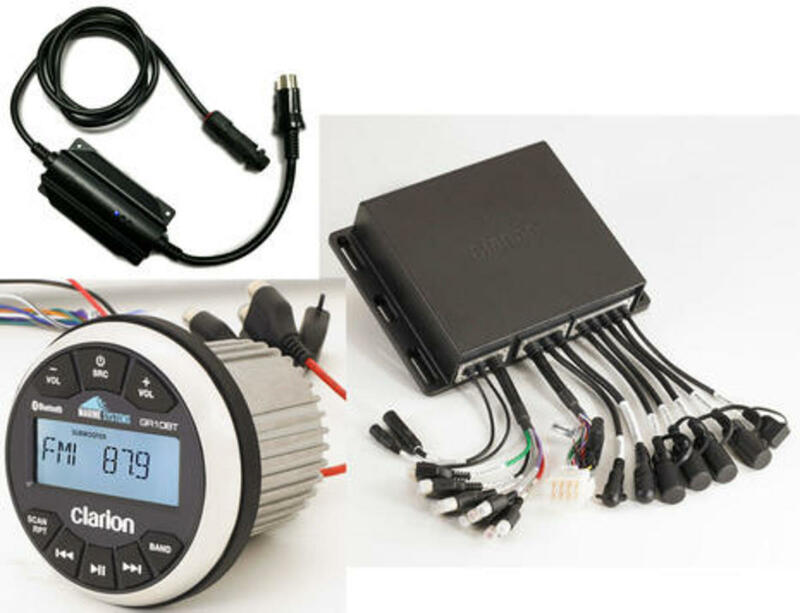 There&apos;s nothing about the new marine gear on Clarion&apos;s site yet, and I don&apos;t know pricing, but there will also be a new CMS3 black box system and, yes, a MW6 NMEA 2000 Interface Module that will apparently enable control of these and maybe other Clarion head units from a boat&apos;s multi-function display (MFD). 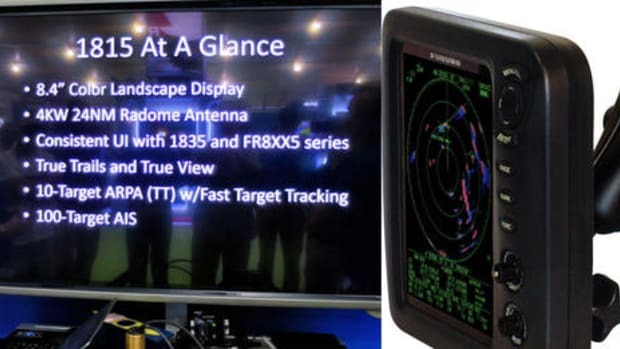 Meanwhile, the Prospec Infinity MBB400 and PRV450 N2K-enabled stereos were apparently shown off at IBEX and more details should be forthcoming. I&apos;m remain skeptical that all these new NMEA 2000 marine audio systems will integrate with MFDs as slickly as Fusion-Link usually does -- and I did hear at the NMEA Conference that more entertainment PGNs are in the works -- but I did see a Rockfort Fosgate working well with a Raymarine eS network during that same conference, and have no doubts that lots of easy interoperability is in our future. 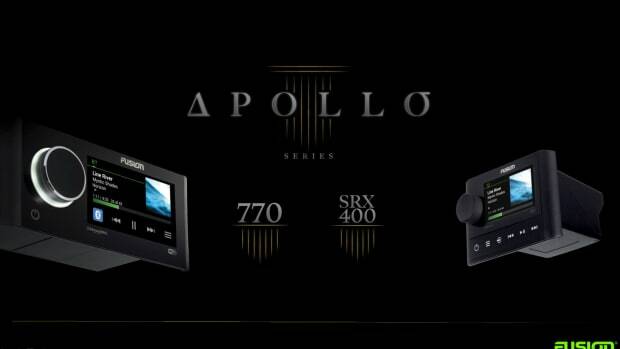 Fusion Apollo Series, truly “The Sum of Audio Innovation”?